Creating private lessons slots can be a time consuming task; however, there is a great way to streamline this process. 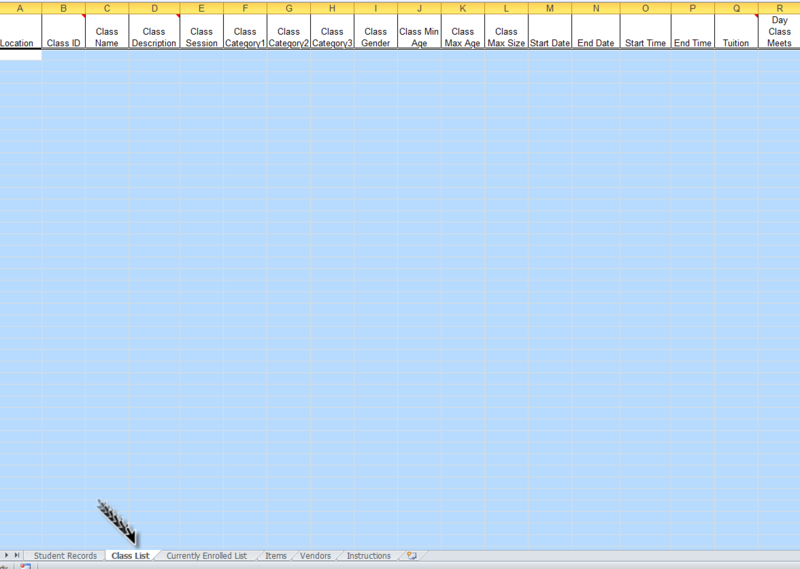 If necessary, create a new Session by pointing to Tools and clicking Edit Drop Down Lists. Click Class Session in the left menu; click the Add Row button; enter a new session name; and Save Changes. Point to Tools and click Import Data. Click the Jackrabbit/EZCare Importer Spreadsheet link. Download the file and save it to your computer. Locate the file on your computer and open it. Click the Class List Worksheet tab (at the bottom). Fill in a row with class details. Enter the Class Name in whatever format you typically use. For example, if you typically create a class as Ms. Lisa-PVT-Tu 1pm, enter it as TName-PVT-Tu 1pm. TName will become a placeholder that you can later replace with each instructor name. Copy the row for as many time slots as you need. For example, if you are open 12 - 8 pm Monday - Friday and offer lessons every half hour, you'd need 80 rows (16 per day x 5 days). If you use the Day & Time in your Class Name, be sure to edit each Class Name field to the correct day & time. We recommend you copy/paste the Session Name, Category 1, 2, and/or 3 from Tools > Edit Drop-down Lists. Once you have all time slots entered, save the file again as you'll be able to reuse it as a master template. Re-open the file and save it with a new name. (In Excel, use File > Save As). If you use the instructor name in your Class Name, replace the TName placeholder using the Find and Replace function. On a PC, hold down Ctrl and click the F key. In the Find and Replace pop-up box, click the Replace tab and enter TName in the Find What field. 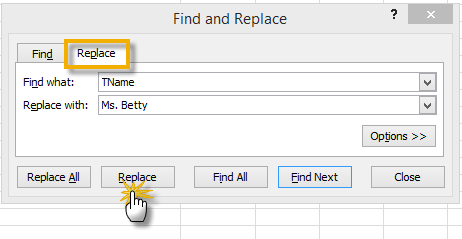 Enter a teacher name in the Replace With field. Continue to click Replace, moving through the Class Name fields until you have updated all classes for that instructor. Add another instructor name in the Replace With field and continue follow the same steps to update classes for this instructor and all other instructors. Be sure to save your file regularly. You can also use the Find and Replace function to update other fields, such as Category 1, 2, or 3. When you have your spreadsheet complete, login to Jackrabbit and point to the Tools menu. Click Import Data. Locate your saved file using the Browse button and click Import. A successful import will indicate the number of rows imported properly. Point to Classes and click Edit All Classes. Set Class Status to blank and click the Search button. Make any edits, such as adding the Instructor to the Instructor field, updating the Day checkbox, etc. Thank you to Jackrabbit Power User, Philip Niverson at Jennings Music Center in Marietta, GA for this best practice.